The J. A. Woollam Co. is a manufacturer of spectroscopic ellipsometers for non-destructive thin film and bulk material characterization. 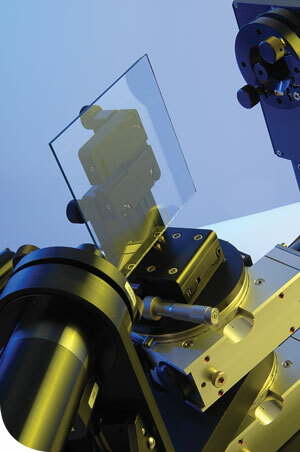 Spectroscopic ellipsometry (SE) has become the standard for measuring thin film thickness and optical constants (n and k). Spectroscopic ellipsometry is used for characterization of all types of materials: dielectrics, semiconductors, metals, organics, and more. A sample ellipsometry measurement is shown in Figure 6. The incident light is linear with both p- and s- components. The reflected light has undergone amplitude and phase changes for both p- and s- polarized light, and ellipsometry measures their changes. Figure 6 Typical ellipsometry configuration, where linearly polarized light is reflected from the sample surface and the polarization change is measured to determine the sample response. The primary tools for collecting ellipsometry data all include the following: light source, polarization generator, sample, polarization analyzer, and detector. The polarization generator and analyzer are constructed of optical components that manipulate the polarization: polarizers, compensators, and phase modulators. Common ellipsometer configurations include rotating analyzer (RAE), rotating polarizer (RPE), rotating compensator (RCE), and phase modulation (PME). Rotating analyzer ellipsometer configuration uses a polarizer to define the incoming polarization and a rotating polarizer after the sample to analyze the outgoing light. The detector converts light to a voltage whose dependence yields the measurement of the reflected polarization. The RAE configuration is shown in Figure 7. A light source produces unpolarized light which is then sent through a polarizer. The polarizer allows light of a preferred electric field orientation to pass. 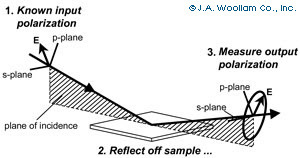 The polarizer axis is oriented between the p- and s- planes, such that both arrive at the sample surface. The linearly polarized light reflects from the sample surface, becomes elliptically polarized, and travels through a continuously rotating polarizer (referred to as the analyzer). The amount of light allowed to pass will depend on the polarizer orientation relative to the electric field “ellipse” coming from the sample. 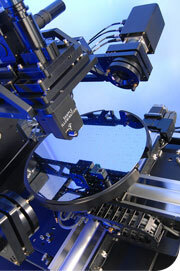 The detector converts light to electronic signal to determine the reflected polarization. This information is compared to the known input polarization to determine the polarization change caused by the sample reflection. This is the ellipsometry measurement of Psi and Delta. The M-2000 line of spectroscopic ellipsometers is engineered to meet the diverse demands of thin film characterization. An advanced optical design, wide spectral range, and fast data acquisition make it an extremely powerful and versatile tool. The M-2000 delivers both speed and accuracy. Our patented RCE technology combines Rotating Compensator Ellipsometry with high-speed CCD detection to collect data from the entire spectrum (hundreds of wavelengths) in a fraction of a second with a wide array of configurations. The M-2000 is the first ellipsometer truly to excel at everything from in-situ monitoring and process control to large-area uniformity mapping and general purpose thin film characterization. The M-2000 utilizes our patented RCE (rotating compensator ellipsometer) technology to achieve high accuracy and precision. The RCE design is compatible with advanced CCD detection to measure ALL wavelengths simultaneously. This ellipsometer collects over 700 wavelengths from the ultraviolet to the near-infrared – simultaneously. With modular optical design, the M-2000 can be attached directly to your process chamber or configured on any of our table-top bases. Advanced design ensures accurate ellipsometry measurements for any sample. The VASE is our most accurate and versatile ellipsometer for research on all types of materials: semiconductors, dielectrics, polymers, metals, multi-layers, and more. The VASE features a rotating analyzer ellipsometer (RAE) combined with our patented AutoRetarder® for unparalleled data accuracy. 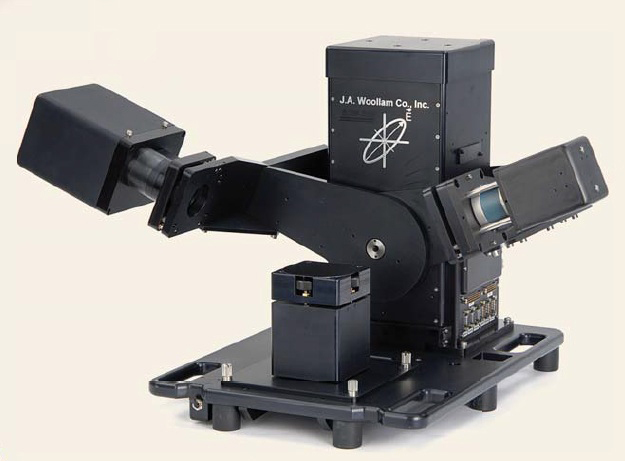 The HS-190™ scanning monochromator is designed specifically for spectroscopic ellipsometry. It optimizes speed, wavelength accuracy, and light throughput, while automatically controlling selection of wavelengths and spectral resolution. The V-VASE features a vertical sample mount to accommodate a large variety of measurement geometries including reflection, transmission, and scattering. Rotating Analyzer Ellipsometers (RAE) maximize data accuracy near the “Brewster” condition - where Ψ/Δ data are content-rich. However, this region can be limiting for samples with reduced signal. The patented AutoRetarder is a computer controlled waveplate which modifies the light beam polarization before it reaches the sample. This produces optimum measurement conditions for any sample, under any conditions. Ψ and Δ over the full range! The application of in situ Spectroscopic Ellipsometry (in situ SE) to process monitoring and control has long been recognized. However, did you know that in situ SE can simplify everyday process characterization and development? 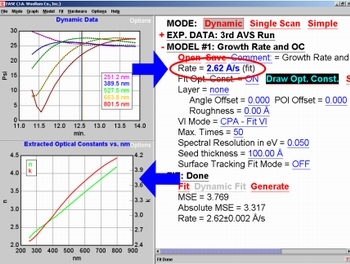 Recent innovations incorporated into the Woollam Co.’s EASE software use Virtual Interface (VI) models to readily determine deposition (or etch) rates and optical constants of the top-most film without requiring a detailed model of underlying layers. VI models allow sequential analysis of each layer of a multi-film stack as they are deposited during a single run. 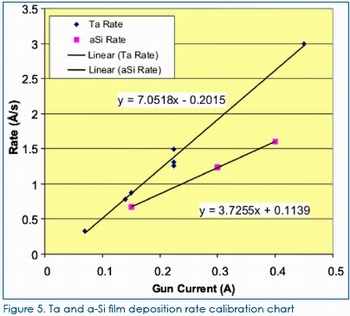 one can easily characterize film deposition rates and optical constants for various conditions. Why use a Virtual Interface? Characterization of film deposition, etching or other processing consists of determining film growth (or etch) rates and optical constants, n(λ) and k(λ), for various process conditions. Obviously, film growth rates can be readily determined from in situ SE data by calculating the change in film thickness over time. Simultaneously, one can also extract the optical constants from in situ SE data. 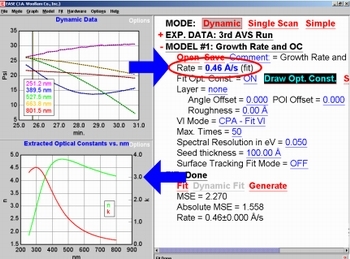 In traditional applications the quality of the analysis depends on optical model accuracy. Unfortunately, modeling errors are often introduced in the underlying layers. The effect is cumulative, making analysis of more than a few layers very difficult unless underlying films are well understood. ‘Virtual Interface’ models simplify analysis by combining the optical response of underlying layers into a ‘pseudo substrate’, as shown in Figure 1. During analysis, the layer above the VI is modeled, while the VI itself remains unchanged. Characteristics of the near surface film can be continuously tracked by constantly updating the location of the VI, placing it at some fixed time interval prior to the most recent in situ SE data. The “depth” of the VI is then determined by the time interval and deposition rate. The GROC and Gen-VI Layers EASE incorporates the VI concept in two different models, the Growth Rate Optical Constant (GROC) and Generalized Virtual Interface (Gen-VI) layers. The GROC layer utilizes the common pseudosubstrate approximation (CPA), which works well for semiconductors, high-index dielectrics, metals, and highly absorbing materials. However, the simplifying assumption used by the CPA to calculate the VI parameters does not work for dielectric stacks. 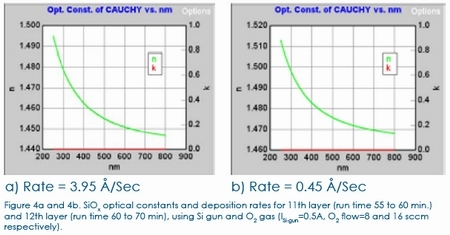 The Gen-VI layer uses exact thin film equations in the VI calculation, making it valid for dielectric materials, semiconductors, metals, or any arbitrary isotropic layer structures, over any time/thickness range. Besides determining the optical properties of the VI, both the GROC and Gen-VI layers calculate the topmost film deposition rate and optical constants n(λ) and k(λ). Both layers assume the film’s growth rate and optical constants do not vary throughout the selected time range. 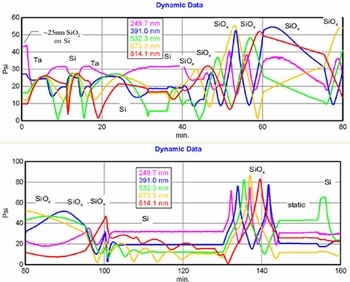 EASE Process Characterization Example Depositions were conducted in a 2-gun DC sputtering chamber connected to argon and oxygen gas sources, with sputter targets of silicon and tantalum. Depositions can include one or both targets, combined with various guncurrents and oxygen flow rates. The system can produce films of a-Si, Ta, Si-Ta alloys, as well as silicon and tantalum oxides of varying composition and stoichiometry. Figure 2 shows the evolution of Ψ at 5 wavelengths, as different layers are sequentially deposited on a starting substrate (consisting of ~25 nm thermally-deposited SiO2 on silicon). The 19 layers included Ta and Si films deposited at sputter-gun currents of 0.1 to 0.5 amps, and the SiOx films deposited using O2 flows of 0 to 16 sccm. Figures 3a and 3b show the GROC layer model for the third and sixth layers of the deposition run. As the figures indicate, the 3rd layer was tantalum deposited at a rate of 2.62 Å/second, while the 6th layer was a-Si deposited at a rate of 0.46 Å/second. In the figures, the optical constants for each film are shown in the bottomleft graphs. Figures 4a and 4b show the optical constants and deposition rate for the eleventh and twelfth layers of the deposition run. As the figures indicate, the deposition rate was 3.95 Å/sec when the O2 flow rate = 8 sccm, compared to 0.45 Å/sec for an O2 flow rate=16 sccm, a 9x difference that can be attributed to oxygen poisoning of the Si sputter target. Once modeling of all the different layers is completed, chamber performance is analyzed. As an example, the Ta and Si deposition-rate calibration chart is shown in Fig. 5.